Let MOVEHUT help you find your ideal commercial property to rent or buy in Edinburgh. No matter what type of commercial property you're looking for, whether it's a shop or a warehouse in Edinburgh, MOVEHUT can help. MOVEHUT allows users of the site to search properties by size, which makes finding your ideal commercial property quick and easy. With MOVEHUT it won't matter what you need, as we have enough choices of commercial properties to buy or rent in Edinburgh, so you should easily be able to find your ideal property. Edinburgh is the capital of Scotland and the seat of the Scottish Parliament. It is a city of historical and cultural importance making it a top tourist destination. Edinburgh has a long association with banking and many financial institutions retain offices and other commercial properties in the city. It is also famous for its annual festival and Hogmanay celebrations. Find a property for sale in Edinburgh right away with MOVEHUT, regardless of what kind of property you need. Make use of our search filters and functionality, it's easy and convinient. Just choose how you want to refine your Edinburgh search, whether it's by distance or property category. So start your search with MOVEHUT today, and take a step closer to owning your ideal property in Edinburgh. Commercial properties come in all shapes, sizes and categories in Edinburgh. We have property listings for industrial and warehouse commercial properties in Edinburgh. We also have properties suitable for use as a meeting room or a large office in Edinburgh. So don't worry - when it comes to property categories in Edinburgh, we have the variety to make your search a breeze. Find the Edinburgh commercial property to rent that's right for you, with just a little help from MOVEHUT. Our commercial properties to let in Edinburgh offer you the widest choice and selection. So browse our website, and let MOVEHUT help you find your future commercial property in Edinburgh. The history of Edinburgh can be traced back to the Bronze Age, The famous castle that dominates the skyline was for many years a royal residence but from the 17th century onwards it served principally a military function. The city developed into two distinct sectors, the Old Town and the New Town. The Old Town is medieval in origin and has preserved its unique character. Due to a lack of space there was little choice but to build higher and higher and some stone buildings stand several storeys high with commercial properties at street level. With up to 60,000 residents packed into the area, and little space to build, the Old Town became desperately overcrowded. The solution was a product of the Scottish Enlightenment, a period of intellectual and scientific progress, which flourished in Edinburgh during the 18th century. In 1766 a competition was held to select the best design for a new residential and commercial development to the north of the Old Town. The winner was local architect James Craig. His plan for the New Town was based on a rational grid-type layout and the residential and commercial properties he built are considered to be among the best examples of Georgian architecture anywhere in the world. As construction progressed the professional classes migrated towards the genteel New Town. Finally completed in the 1830s, the ‘Athens of the North' established Edinburgh as a major commercial and cultural centre. This saw an expansion of the banking sector making Edinburgh the most important financial centre in the UK outside London. As wealth continued to grow, so did demand, and new business and retail commercial properties flourished. This wealth was not spread evenly, however, and the disparity between the prosperous New Town and the less well off residents left behind in the Old Town became more pronounced. Between 1800 and the middle of the nineteenth century, the population of Edinburgh grew rapidly and the railway reached the city in 1842. But because Edinburgh had not developed any significant manufacturing base it lost its status as Scotland's leading city to industrial Glasgow. Throughout the twentieth century Edinburgh remained a centre of banking, finance and insurance with a buoyant commercial property market. At the same time tourism became a major contributor to the city's economy. In 1999 the Scottish Parliament retuned to Edinburgh and the new Parliament building opened in 2004 attracting further commercial property development. Today Edinburgh is a World Heritage Site. Edinburgh has a growing population with the most recent figures putting it at over 486,000. Of these, the vast majority are under 44 making Edinburgh a youthful city. Around 95% of the population identify themselves as from a white ethnic background. Edinburgh has a stable economy dominated by the service sector, particularly finance. It has world class business accommodation with rental costs for offices and serviced offices being a third of those in London. There is commercial property to buy and rent in prime city centre locations and lower cost properties in areas like Leith and Edinburgh Park. 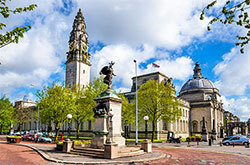 There are also specialist commercial properties available and development opportunities in a number of attractive locations. The Scottish education system has an enviable reputation and Edinburgh has some of Scotland's best schools and world class universities. The city caters for a range of educational needs from nursery school to higher education. 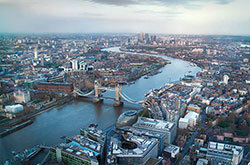 The city's vibrant and inspiring atmosphere makes it a great place to teach and study. 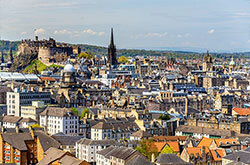 Edinburgh has four universities and a student population of over 100,000. The universities are; The University of Edinburgh, Heriot-Watt University, Napier University and Queen Margaret University. There is a huge choice of secondary and primary schools in Edinburgh with high standards across the board. Nine out of the top fifty secondary schools in Scotland can be found in the city. The presiding local authority is Edinburgh City Council. The city is represented in the Scottish Parliament by 6 MSPs and elects 5 MPs to the British Parliament. Edinburgh is situated in the eastern part of the Central Lowlands bordered by the Pentland Hills on one side and the waters of the Firth of Forth on the other. Edinburgh Summers are generally fine. Winters are long with frequent frosts. December, January and February are the wettest months, but snow in winter is infrequent. The best time to visit to Edinburgh is during spring when the weather is pleasant. Edinburgh is well served by all transport links. Lothian Busses cover the city and surrounding suburbs. Work began on Edinburgh's tram system in 2008. Haymarket Railway Station is a busy commuter stop while Edinburgh Park serves business and retail commercial property developments. Waverley Station is a major rail hub on the East Coast Mainline catering for around 14 million passengers annually. The city's international gateway is Edinburgh Airport, the busiest in Scotland. Rugby Union venue Murrayfield is the largest stadium in Scotland with a capacity of 67,000. The city has two football teams playing in the Scottish premier league, Heart of Midlothian and Hibernian. Edinburgh is UNESCO World Heritage Site and a major cultural centre. Princes Street is the city's main shopping area with a wide range of retail commercial properties ranging from major high street chains to upmarket independents. There are also a number of out of town retail and leisure commercial property developments including Ocean Terminal where former Royal Yacht Britannia is permanently moored. There is a great variety of entertainment on offer in Edinburgh, including the world famous Edinburgh Festival which takes place annually between July and September. The festival features theatre, music, comedy and music. The annual Hogmanay celebration that takes place around the commercial property districts of Princes Street and the Royal Mile is also a major attraction. Edinburgh's daily newspaper is the Edinburgh evening news. There are two commercial radio stations based in the city. Other media outlets also have offices in Edinburgh. Large scale pop music events are regularly held at Murrayfield and Meadowbank. There are a host of small to medium sized venues catering for popular taste. The Edinburgh Symphony Orchestra and the Edinburgh Grand Opera provide musical entertainment for those with more classical taste. Apart from the Edinburgh Festival, which is the biggest arts festival in the world, there are theatre productions in the city throughout the year. Theatres include the Playhouse and the Lyceum. Edinburgh has a number of outstanding museums and galleries. These include The National Museum of Scotland and the National Gallery of Scotland.